Pakistan lags behind its coverage of climate change issues. We are a growing economic power but the emissions are set to soar too and not many people are aware of what kind of consequences climate change could have on our environment. To add salt to wound, our neighbors and even countries like Bangladesh, Sri Lanka have a good understanding and are well aware of climate change and of its impact. We, as a vulnerable country, should also need to conduct such awareness campaigns for climate change. 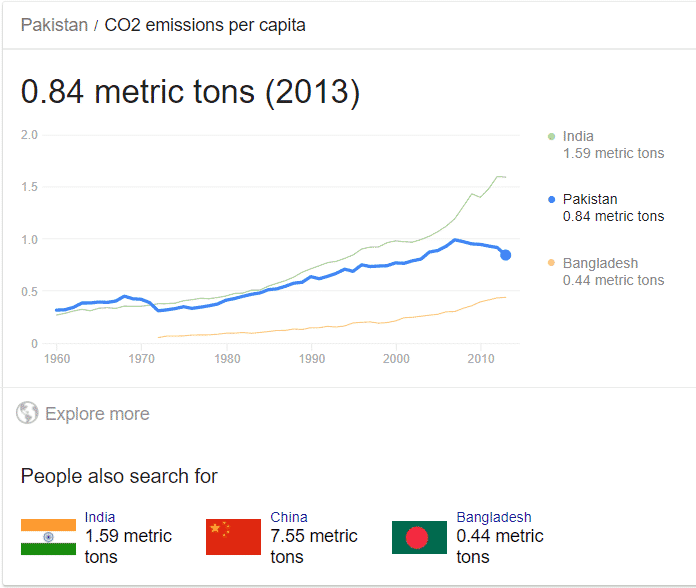 Pakistan’s per capita emissions of greenhouse gases today is one of the lowest in the world. Yet it ranks amongst the top ten countries most affected by climate change during the last twenty years. We have not only faced floods, droughts or even the 2015 Karachi heatwave but also other impacts such as glacier melting, rising temperatures, rising sea level just to name a few. Our carbon emissions have also grown by 123% between 1994 and 2015. Not to mention that the Prime Minister has set the goal for Pakistan to become one of the top 20 economies of the world by 2025 which no doubt means that development will have to take place and to achieve this economic growth, there’s going to be a focus on enegy and transport. The estimated carbon growth is expected to be from 405 metric tons to 1,603 metric tons in just 15 years. That is carbon emissions rising 4 times which is huge number. With the rate at which Pakistan is developing and the climate is being affected, it is important to take into account our environment and to think about what might happen when we pass the stage of no return. Developed countries have already got developed by poising the environment and now pushing the developing world not to do so. Pakistan is a thin (on map) country and will be effected anyway by environment polluted by others. We cannot afford high energy costs and need to use all cheap fuels. I remember Modi criticized the developed world in Paris Summit and asked them to contribute to environmental friendly energy in developing world.
) How they remove CO2 & add Oxygen In Environment ?? ?